Things are good in Eugene these days. Not only is summer in full effect and the weather great, but the hometown Oregon Ducks are compiling a fantastic recruiting class that seems to continue to heat up as well. Last season, the Ducks finished with the No. 16-ranked recruiting class. The Ducks landed five-star defensive lineman Canton Kuamatule, the first five-star to sign since Oregon landed in-state stud Thomas Tyner in 2013. Also, the 2015 recruiting class finished with seven four-star players and a total of 22 signees. Last year was good, but this year has the potential to be great. In fact, more talent committed to the Ducks over the past week; now they have 14 players verbally committed and already have eight four-star recruits pledging to be Men of Oregon. 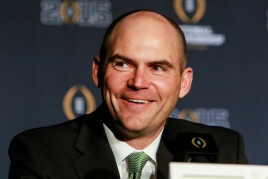 Coach Mark Helfrich and his staff seem to have hit their stride early on in this recruiting season. Last Thursday, July 9, was a big day for Oregon. The Ducks received verbal commits from a pair of four-star athletes, defensive back Jared Mayden and linebacker LaMar Winston. Mayden is a big get for the Ducks. The No. 134-ranked player in the nation, and No. 11-ranked cornerback had 43 scholarship offers in total, and had Oregon, Ohio State and Alabama in his top three. Mayden joins fellow four-star cornerback Troy Warner (No. 23 cornerback), Brady Breeze (No. 9 safety), and Troy Dye (No. 42 safety) as the defensive back verbal commits for 2016. Defensive back isn’t necessarily a need for Oregon, as their roster is filled with freshman and sophomores, but a team can always improve its depth. Mayden will join a talented secondary when he arrives on campus next season, but considering that the Oregon roster is already fairly young in the secondary, and they already have two commits at the position for this year, will the Ducks take another cornerback? I believe they will for two reasons. First, Dye will likely play outside linebacker or a box safety hybrid as a Duck. Dye stands at 6-foot-3 and weighs in at more than 200 pounds; if he can add some size and retain his speed he could bring some needed depth to the linebacking corps. Second, the Ducks have a shot at getting the No. 7 corner in the country, Nigel Knott, according to Justin Hopkins of 247sports. Knott would instantly add a tremendous talent to an already strong secondary class for the Ducks. Hopkins writes, “Nigel Knott remains one of the top targets and [is] still a realistic option. The staff has some ground to make up but can still do it if he gets on campus.” Currently, Knott is considered a soft Florida State lean, but if he gets a visit to Eugene, who knows what could happen — I’m sure there would be plenty of talk about the Rose Bowl thrashing the Ducks put on the Seminoles. Stay tuned to see what develops with Knott if/when he gets to visit the Oregon campus. 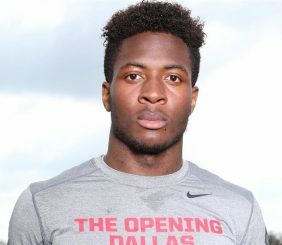 Another recent commit, LaMar Winston‘s addition will be absolutely huge for the Ducks. Much has been made previously about Oregon’s needs for linebackers for the future, and getting a verbal from Winston certainly helps. Aside from being a needed body for future depth, Winston is a very skilled linebacker. Standing 6-foot-4, he has the size and ball recognition to transition very well to the next level. Give him some time to develop and add muscle to his frame, and the sky is the limit for this kid. 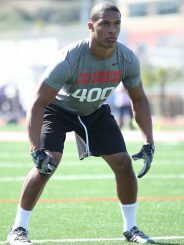 He joins four-star player Darrian Franklin as the only linebackers verbally committed to the Ducks. Another thing to think about with Winston is that he is an in-state player; after last year’s class signed zero in-state guys, the Ducks have three players verbally committed this year. In fact, those are the only three in-state players who have had offers from the Ducks. Justin Hopkins said it perfectly: “Let that sink in. 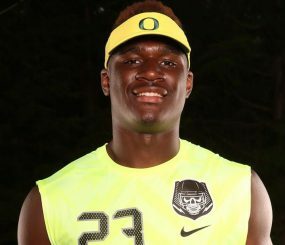 Oregon has only offered three players in-state and all three of them are committed by July … That’s some power. That’s creating a demand.” The Ducks have effectively become a national brand with the ability to bring in players from all over the country, and when they want to, they can hand-select the in-state talent they desire because they are by far the best program in the state of Oregon. Bryce Youngquist at The Opening Los Angeles. The Winston verbal commit had an impact in other areas of recruiting as well. The No. 11 linebacker in the 2016 class, Bryce Youngquist, has decided to move his commitment date up in the wake of Winston’s verbal commit. Youngquist would be another big get for the Ducks, again adding depth and talent at a position that thins out tremendously after the next two seasons. According to Hopkins, Youngquist said, “Oregon has always been high on my list. There isn’t anything bad about the school. Eugene is a great city, a football town and I love the program.” Youngquist plans to make his decision “sometime in the next two or three weeks.” He is considered a strong Oregon lean, and his recruitment will be something for all Duck fans to keep an eye on in the upcoming weeks. This recruiting class could be the highest-rated class in program history by the time everything is signed and official. With seven seasons in a row with at least 10 wins, the Ducks have ascended to the “reload not rebuild” mentality in recruiting. Only time will tell for sure how this class will look come signing day, but as of right now, this class is looking incredible. Oregon had five-star defensive lineman Rashard Lawarence on campus for a visit this past Tuesday. The Ducks are considered a long shot to sign the DT, but anything can happen once the player arrives on campus for the visit. Oregon target Jordan Parker has decommited from UCLA. Even though the No. 12-ranked corner is interested in the green and yellow, he has yet to receive an offer from the Ducks. Stay tuned for updates.